The Agora Gynaecology & Fertility Centre in Hove, East Sussex, specialises in diagnosing and treating the causes of infertility, offering bespoke fertility services to both NHS and privately funded patients within a uniquely caring and supportive environment. 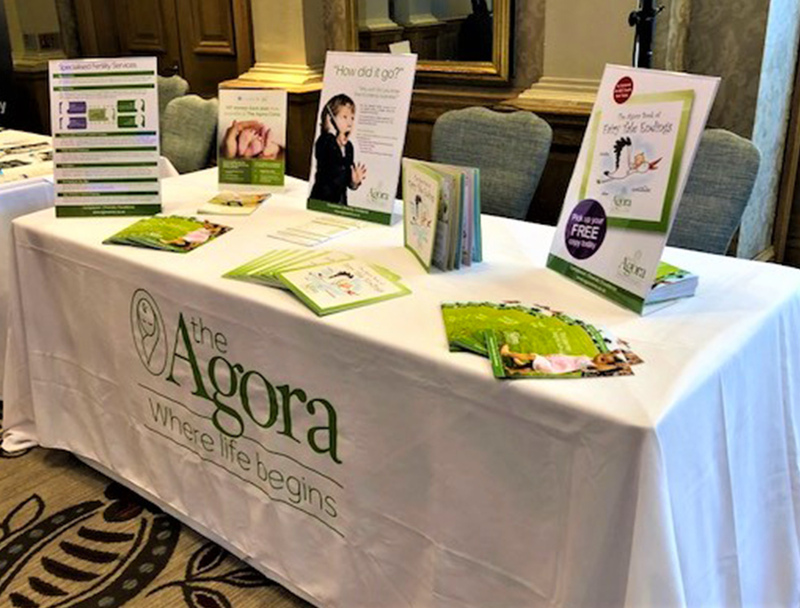 Having worked with the clinic since 2014, Simpsons Creative has been involved with a wide range of marketing and promotional projects for the Agora, including print and digital advertising, social media management, company stationery and branding. Due to the nature of the services the Agora offers, it was of paramount importance that we approached any marketing tasks with sensitivity and empathy, particularly in regard to content and imagery. The agency’s initial introduction to the Agora was to give the clinic website a refresh and it has undergone several iterations since. In fact, the website has just gone through its latest transformation, to give a more user-friendly and responsive experience, in keeping with the Agora’s modern mindset. To keep the Agora website up to date and engaging, as well as to boost its Google search ranking, Simpsons Creative regularly updates the site with home page banners promoting special events, open evenings and services, news items and blog posts. This in turn feeds into the social media marketing calendar and helps the clinic to stay visible. The Agora is active across Facebook and Twitter and Simpsons Creative posts on their behalf to raise the company profile on social media. Typical content includes clinic news, promoting new and existing treatments, raising awareness of causes supported by the clinic, links to partner organisations, sharing patient feedback and drawing attention to fertility news stories and breakthroughs in fertility research. This element of the marketing mix is especially important as it allows the clinic to engage with past, current and potential patients as well as promoting clinic services and providing helpful information for anyone considering fertility treatment. The logo is central to the overall Agora brand, and as such has influence over design decisions when producing business stationery, adverts, leaflets and all other marketing materials. To ensure brand continuity the Agora logo has its own Pantone reference and is available in three colour formats: CMYK for full colour printing, RGB for online and screen use, mono where the logo is black instead of green and finally the option to use a white version of the logo against a green background. The Agora is very proactive about its advertising, which enables Simpsons Creative to realise a range of different advertising concepts, each one tailored to the advertising medium and specific audience. 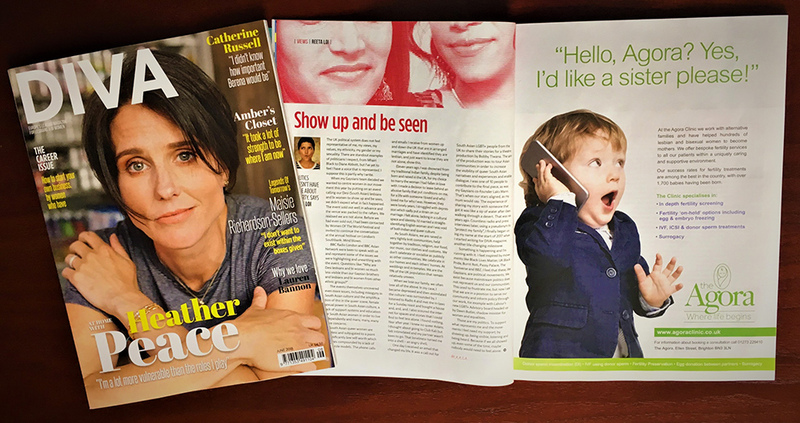 Examples of advertising include placements in targeted LGBTQ publications such as DIVA magazine (both digital and print), Europe’s best-selling magazine for lesbians and bisexual women, and the annual Brighton Pride Guide, as well as promotional literature for the Alternative Parenting Show. 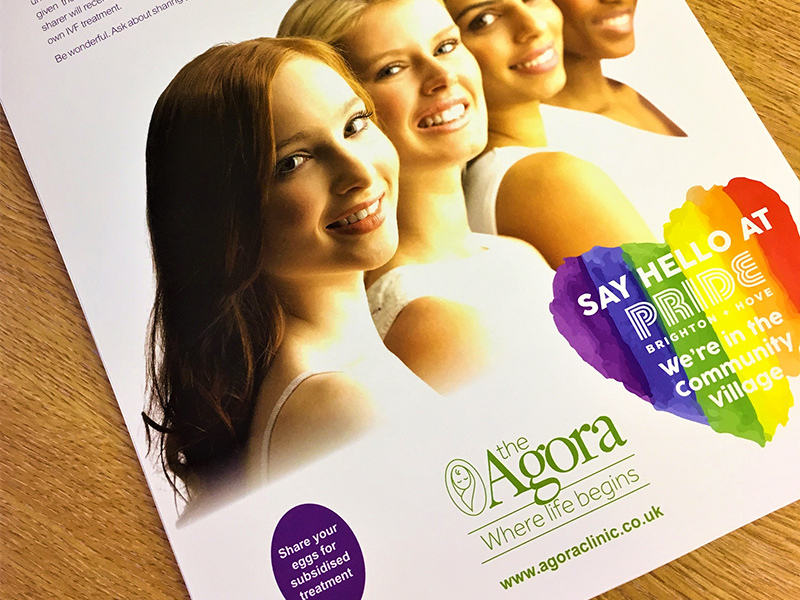 The Agora specialises in treatments for LGBTQ individuals and couples, so advertising in this way allows the clinic to speak directly to that audience and tailor their message accordingly. Another key client base for the Agora are couples or single women requiring fertility treatment, or women looking to preserve their fertility. A different approach was adopted for this demographic; posters at Hove and Three Bridges train stations and sponsorship of a business event at The Grand Hotel (including advertising in the event programme) targeted commuters and white-collar workers who were considering fertility treatment but did not necessarily want to travel to London. 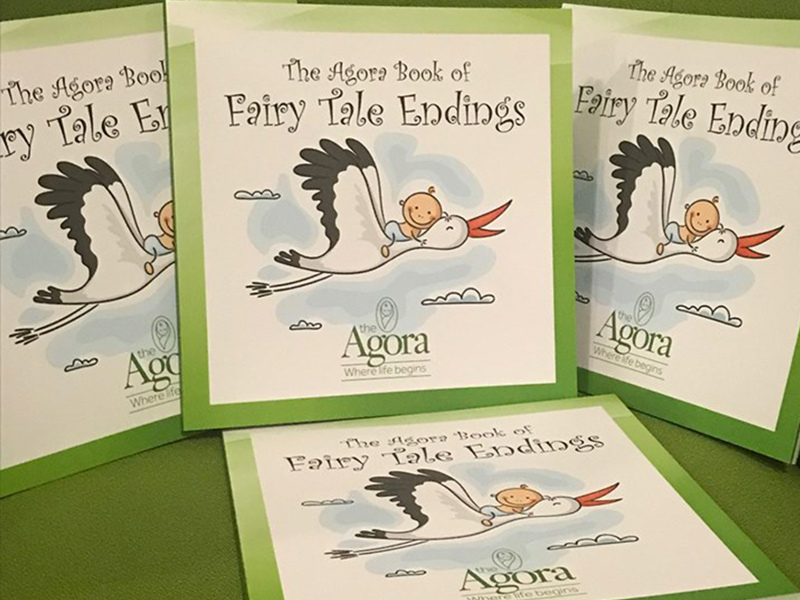 To celebrate the clinic’s 10th anniversary, founder and Medical Director Dr Carole Gilling-Smith had the wonderful idea of creating a book with a collection of true stories featuring Agora patients and their fertility journeys, which would be available as a giveaway at the clinic and during promotional events. The creative team began researching different types of fairy tales, looking at illustrations, themes and colours to see if there was a trend or style that was synonymous with fairy tale story books. 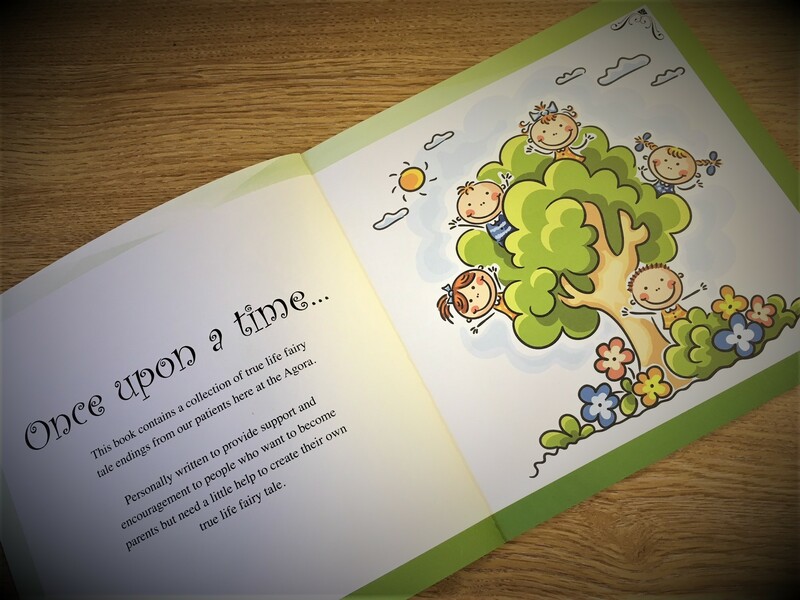 The team also utilised the Agora branding to ensure perfect harmony of the two and put together ideas for a front cover to show how the book could look. Once this design phase was agreed and we had the ten stories, the team set out to complete the book. Brighton Pride is the UK’s biggest Pride festival, bringing together thousands of people from the LGBTQ community. For the Agora, who are based in Hove, this was a fantastic opportunity for them to show the LGBTQ community some of the life changing services the clinic offered. The Agora secured a parade float and asked Simpsons Creative to design the graphics for the vehicle banners. Pride’s well-known rainbow colour scheme was the inspiration for the striking visuals, erasing the ‘clinical’ view that many people have of the fertility industry. 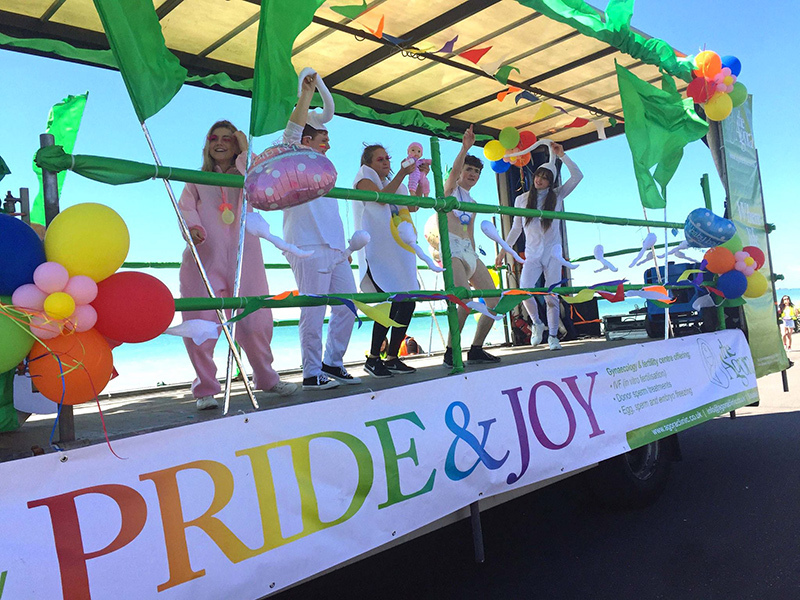 The headline ‘Pride & Joy’, which the client loved, featured prominently and along with some attention-grabbing imagery, enabled the float to convey key messages to the crowd. Colourful A5 leaflets to hand out to potential customers were also designed with the same imagery and headline, which all helped to increase awareness of The Agora and its services. To reinforce the message, Simpsons Creative also adopted the ‘Pride & Joy’ visuals across the Agora’s social media pages to capitalise upon the event and ensure brand continuity across all of the client’s marketing platforms.